In an effort to perhaps squeeze credit card issuers out of Amazon transactions, the world’s largest retailer is offering 2% back when you don’t use a credit card. Yes, if you use a debit card or bank account to reload your Amazon account, you’ll get 2% added to your Amazon gift card balance each time. This means you can keep reloading your Amazon account and making purchases and effectively earn 2% on each transaction (or get 2% off the purchase price each time). 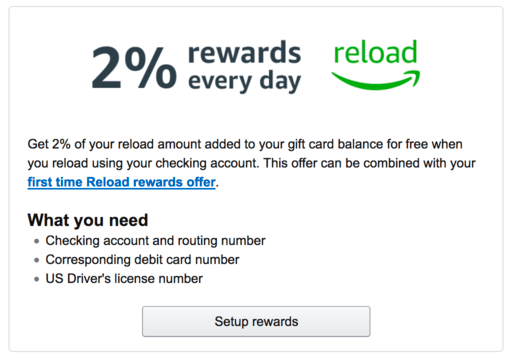 The caveat is that it’s not a cash back program – your Amazon account just gets the extra 2% on each reload. So you wind up with more Amazon cash. The move appears to be partially aimed at Walmart, which it is currently battling for the lower-income population and maybe the credit-averse group. The other reason is to cut out expensive interchange fees, which credit card issuers charge merchants for the convenience of using plastic. Typically, these are passed along to consumers in the form of higher retail prices. These fees tend to be more than 2%, so Amazon can actually make out on this deal while still giving its customers rewards on every purchase. First off, you need to be an Amazon Prime member to take advantage of the Amazon 2% rewards program. Secondly, you have to set up the 2% rewards account by following the link once logged in to Amazon. It pops up a lot when you’re on the site. From there all you need to do is reload your Amazon.com gift card balance using your checking account and linked debit card. You need both your debit card and checking account because Amazon will route orders through your debit card instead of your bank account if they need to fulfill your reload quicker. To that end, the funds should be available within five minutes, though some reloads may require further review and could take up to four hours. The rewards will also post when your reload posts, which is a plus. For example, if you load $100 to your Amazon account, you’ll wind up with $102 relatively instantly. I perused the terms and conditions and found that this is a limited-time offer and only good while supplies last. Additionally, the maximum single reload amount is $2,000. Also be careful if you do multiple large loads on the same day because Amazon says the maximum rewards benefit that you may receive from this offer is $196 per day. Of course, that’s still $9,800 worth of reloads in a single day, which would be a pretty impressive amount to spend. 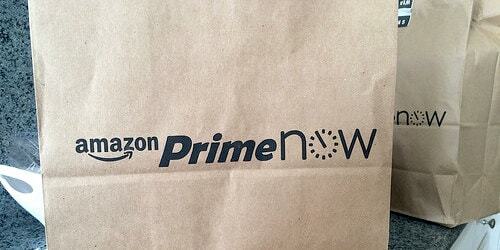 Should You Just Use a Credit Card to Reload Amazon Instead? This all begs the question, is this a good deal? And are you better off using a credit card instead? Well, yes and no. As I mentioned, this deal seems to target those who either don’t like credit cards or can’t qualify for one. So if that’s the case, and you use Amazon regularly, you might as well earn the 2% in rewards. Alternatively, if you can qualify for a credit card and are into credit cards, there are probably better options. For example, both the Amazon Prime Store Card and the Amazon Prime Rewards Visa Card from Chase earn 5% cash back at Amazon. And that comes in the form of a statement credit, gift cards, and so on. This might be better than just receiving more Amazon currency, which obviously requires more spending at Amazon. Other options include the use of a or 2% cash back credit card, of which there are a few. Or simply take advantage of a rotating cash back credit cards that offers 5% off at Amazon, such as Chase Freedom or Discover it. If you happen to have the older Chase Ink business credit card, you can get 5% off at Amazon simply by purchasing Amazon gift cards at office supply stores because you earn 5X Ultimate Rewards there. In summary, there are lots of better options for earning cash back on Amazon purchases, though if you don’t have/want a credit card, this is one way to at least get something back. Previous Previous post: UBS Visa Infinite Credit Card: Does It Deliver Luxury?